The World of Hyatt Visa earns you...wait for it...World of Hyatt points, which happen to be one of the most lucrative currencies in the hotel industry. While Hyatt’s footprint is nowhere near as large as, say, Marriott’s, they have a presence in almost every major and midsized market (especially in North America), and free nights start at at meager 5,000 points. Not for nothing, but I’ve found that even “cheap” 5,000 point Hyatt properties, even ones within a stone’s throw of an airport, are always updated and well maintained, which you just can’t bet on with other chains. In fact, I just spent a night at the Hyatt Place Knoxville, a category 2 property. Located right in the middle of downtown, it’s at the top of the Knoxville hotel leaderboard on TripAdvisor, features fully updated rooms, and boasts a lobby bar that actually has a lot more character than you’d expect from a standard chain hotel. For 8,000 points, it was an insanely good value. Even the highest-end properties in Hyatt’s portfolio top out at a reasonable 30,000 points, including places that can cost upwards of $1,000 per night like the Park Hyatt Paris Vendôme. Compare that to similar Marriott properties, which can go for as much as 100,000 points per night during peak travel seasons. I’ve enjoyed several Hyatt stays where my points were worth more than $.03 each — an undeniably excellent return. The World of Hyatt Visa nets 4x points per dollar on all Hyatt purchases (plus the standard five points per dollar that you earn on Hyatt stays regardless), 2x points on dining, airlines tickets purchased directly from the airlines, local transit and commuting, and on fitness club and gym memberships, and one point per dollar on everything else, so there are a lot of ways to rack up points here. You’ll earn 25,000 World of Hyatt points after spending $3,000 in your first three months, and then another 25,000 after spending $6,000 total in your first six months. The card does have a $95 annual fee (not waived in the first year), but that’s offset by a free night award on your cardmember anniversary. More on that later. That 50,000 points could mean a whopping 10 free nights in a category 1 hotel (which, again, will probably be pretty nice! ), or at least two free nights in all but the most elite Hyatt properties in the world. As long as your card is open, you’ll automatic have Discoverist status at Hyatt, which basically gets you late checkout and free bottles of water. Nice, but not exactly mind blowing. That said, the card does make it a lot easier to reach the Explorist and Globalist tiers, which include perks like room upgrades and club lounge access at select properties. Just by having the card, you’ll get five nights of elite status credit every year (you need 30 nights to hit Explorist, and 60 for Globalist), plus two more nights for every $5,000 you spend, regardless of what you purchased. Personally, I don’t travel enough to chase status, but what I do love is the annual free night award, valid for any Category 1-4 hotel in the Hyatt portfolio. Category 4 rooms would normally set you back 15,000 points, and many of these properties would cost $300 or more per night to book, so this perk more than makes up for the $95 annual fee. Just note that you won’t get a free night award when you sign up; it kicks in on your first cardmember anniversary. 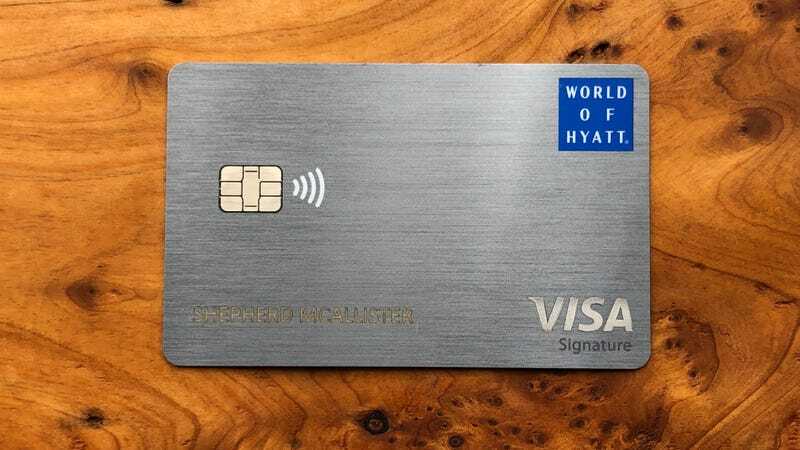 While the elite qualifying nights are great for frequent travelers, the World of Hyatt Visa is a terrific addition to even an occasional traveler’s card collection. The 50,000 point welcome offer means you can splurge on high-end hotels that turn a good vacation into a great one, or you could stretch them out into a bunch of free nights at solid hotels as you need them. Plus, the annual free night is a great excuse to take a quick weekend trip, or even a staycation in town, especially since you’ll get that free water bottle at check in. If you really want to maximize the card though, I’d suggest pairing it with our recommended suite of Chase Sapphire and Freedom cards, since the points you earn with those can transfer to your World of Hyatt account to help you earn free nights even faster.